If you are looking for information on the Gandolfo's New York Delicatessen franchise business opportunity, Gandolfo's New York Deli franchises or Gandolfo's New York Delicatessen franchising, then you have come to the right place. Great Food, Great Systems, Great Support! and we invite you to grow with us. Craig Gandolph, entrepreneur and creative genius behind the Gandolfo's New York Deli Restaurant, grew up in New York and worked in several local delicatessens, where he learned the secrets to creating great deli food. 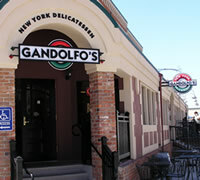 He moved to Utah in 1989 and founded Gandolfo's New York Deli soon afterwards. In 2002, Craig partnered with Dan Pool, formerly, a Division President of Golden Corral Restaurants, restaurant entrepreneur and Gandolfo's New York Deli franchisee. Dan with his lifetime of experience in the restaurant business, commitment to excellence and a never ending passion for the success of our franchisees, leads the way as CEO. Through his efforts Gandolfo's New York Deli will open our 46th Deli in May 2009. Our Delis are now located in 16 states with more on the way. Dan's vision is to open the 500th Gandolfo's New York Deli by 2020. 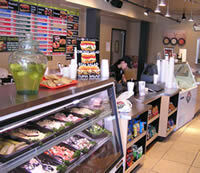 Why Choose Gandolfo's New York Deli?